You assume it’s America’s tallest contiguous state. Full of mountains and hot springs and Peyton Mannings. 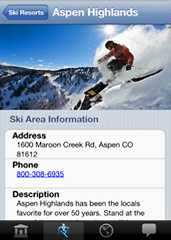 Introducing Ski Colorado Hot Springs, your iPhone guide to skiing and large-scale hot-tubbing in the Centennial State, available now. It would be ridiculous if you went to Colorado this season and didn’t have this app. It’s got everything you need to know about every ski and hot-springs spot in the state. And if you can’t see why that’s useful, let us know how you feel about a few hours of soaking in steaming therapeutic mineral water after a day of storming Beaver Creek. The app is simple. Let’s say you’re weekending at Purgatory Lodge (because that just sounds tough). Bring it up on the “ski resorts” tab on the app, and read a little about what you’re in for... Let’s see here—35% advanced/expert trails, 10 lifts, 260 inches of snowfall annually and, ooh, sleigh rides. Now check out the “hot springs” section. You’ll have directions to the nearest place to unwind in a 112-degree pond surrounded by treehouse lodges and snowcapped Rockies. Remember, it always goes ski, then hot springs.